Most people will agree that pet shops and garden centres should not sell rabbits. But buying from a breeder is equally misguided in Cottontails’ opinion. You may be surprised to hear that the majority of rabbit breeders have an appalling welfare record – the equivalent of puppy farms or worse. And with over 67,000 rescued rabbits needing homes, purchasing from a breeder is both unethical and unnecessary. If you care about rabbits, please read on. Breeders supply shops so anyone who objects to pet and garden stores selling rabbits should avoid breeders as well. they cull them, a polite word for killing them, without veterinary assistance. This frees space in their rabbitry to breed more rabbits. It’s a never-ending cycle. Most breeders house their rabbits in very small hutches (just 60cm/2ft wide) piled one on top of the other. The smaller the hutch, the more rabbits they can pack in. Apart from lactating females, the rabbits tend to be housed singly in these cramped quarters. They are unable to stand up as the cages are rarely higher than 30cm/1ft. Please note: even breeders who call themselves “caring” rarely provide a run for daily exercise. The cage floor is often made of wire for easy cleaning although it’s hard on the rabbits’ feet. Many breeders don’t offer hay and straw because they are “messy” and high maintenance. As a result the rabbits have no bedding to lie on and nothing to chew or dig in to satisfy their natural needs. The rabbits are fed convenience (dried) food rather than grass, hay and vegetables (see point 4). They don’t have toys to keep them occupied. All they do all day is pace up and down their tiny cages, chew on the wire bars, and throw themselves against the cage walls in frustration. Breeders take advantage of the fact that rabbits cannot bark or meow to show their suffering. They usually operate in their back yard out of sight and don’t need a licence. Breeders’ rabbits are less – not more – healthy because they are so interbred. Many suffer from gastrointestinal problems as they are not fed enough fibre and are weaned off early from their mothers. These rabbits sometimes die within days/weeks of being sold, which is heartbreaking when they are treasured pets. Others develop health problems as a result of being bred with “squashed” faces, e.g. overgrown teeth, abscesses and blocked tear ducts. Breeders rarely take sick rabbits to the vet’s. It’s easier and cheaper to kill them and breed some more. Rabbits with contagious illnesses such as respiratory problems are disposed of especially quickly. One breeder we spoke to encouraged caregivers to have their sick bunny euthanised and buy a new one – from him of course – even though the illness was treatable. The same breeder called his rabbits “stupid” instead of giving them a name. Breeders give incorrect advice to rabbit caregivers. Many simply don’t know how to care for companion rabbits because to them rabbits are just breeding animals. For instance they rarely recommend neutering – which enables two rabbits to live together without fighting or breeding, feeding fresh foods, or providing a large living area. They sell rabbits as cheap, low maintenance pets, which they can be if you just keep them in a hutch and feed them dried food, but this is not how companion rabbits should live! Once they’ve made a sale, breeders rarely take a rabbit back if there’s a problem. When they do, they usually cull the poor rabbit as in their view he’s not worth the trouble. Rabbits’ life is seen as disposable. Breeders use rabbits like breeding machines as soon as they are old enough (from around 3 months). Some even resort to force-breeding by tying female rabbits who don’t want to be mated. Female rabbits are made to raise litter after litter and are put down when they become less productive (i.e. they give birth to fewer babies). Some simply die of exhaustion. Breeders often hit or cull rabbits who thump, nip and growl – because they are afraid of being handled or traumatised about their living conditions. There are already dozens of rabbit breeds. Yet breeders often justify their activities by saying that they are creating new breeds or “saving” existing ones. Invariably this requires breeding and discarding thousands of rabbits whose only misfortune is to be the “wrong” shape or colour. It may also involve additional cruelty, for instance some breeders keep their rabbits in darkness to obtain certain fur markings, and lop ears were originally developed by housing rabbits in hutches so low they couldn’t hold their ears upright. Some breeders breed for specific features (e.g. prominent ear veins) to facilitate laboratory experiments. Breeders who show rabbits are more disreputable. A small number of them decide in advance how a breed should look, and this becomes the “standard” which other breeders must follow. The rabbits’ health and welfare are disregarded – breeders commonly breed for features that cause discomfort and pain, e.g. short faces (which lead to eye, dental and respiratory problems), unnaturally long hair, ears so long that the rabbit trips over them, to name a few. It’s very sad that some of these creatures don’t even look like rabbits anymore. Inevitably show breeders become obsessed with producing physically “perfect” animals in order to win money and prizes. Rabbits who are not of show standard are discarded as described in point 2. Rabbit shows may appear like a fun day out. But look at them from the rabbits’ point of view. It’s very stressful to be transported to and from the shows in carriers where they can barely turn around. Show venues tend to be smoky and noisy places. On arrival the bunnies are displayed in wire cages for everyone to poke and look at. Some of the cages are so small the rabbits can’t even stretch or lie down. Water and bedding are rarely provided. The most frightening experience for show rabbits is to be dragged out of their cages, poked and probed by the judges, many of whom show little sensitivity; the process is repeated for every class the rabbits are entered in. If a rabbit doesn’t win, he’s barely worth feeding and taking home. Show breeders have been known to dispose of “losers” by leaving them behind after the show or even throwing them away with the rubbish. In order to show rabbits, breeders have to fit them with metal rings which the rabbits sometimes outgrow, leading to infections and restricted movement. Some pet rabbits bought from breeders have to have them removed under anaesthetic or even have a leg amputated. Microchipping would enable to identify the rabbits safely. To the majority of breeders rabbits are a cheap commodity – often referred to as “stock” – and a means of financial gain. Breeding rabbits and deciding what they should or shouldn’t look like, or who should live or die gives them a sense of power and purpose that they often lack in their personal lives. Rabbits don’t have a voice so it’s up to us to spread the word and campaign to end this cruelty. Because of the way breeders keep rabbits, buying from them is sometimes seen as rescue. Unfortunately this only perpetuates the trade. Please don’t even be tempted to go to a breeder or rabbit show. Even if breeders were the most caring people in the world, there’s no excuse for breeding more rabbits when thousands of rescued ones need homes. If you can offer one or a pair of rabbits a good home, please search The Bunny Hopline. Rescue centres have rabbits of all shapes and sizes, from pedigrees to adorable crossbreeds. Babies and young rabbits are often available as many pet rabbits sadly are discarded within a few weeks of purchase. 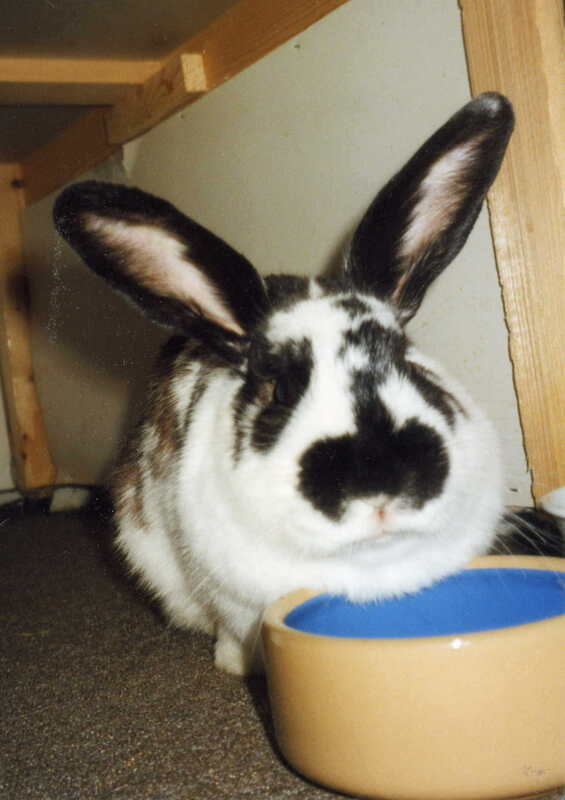 The other advantage of adopting from a shelter is that rabbits are usually neutered and vaccinated.